Israel’s largest union is planning an emergency meeting for tomorrow, Thursday, November 1, to discuss the matter. Histadrut Chairman Avi Nissenkorn is expected to announce a nationwide strike, after the government failed to respond to his call for action over the past few weeks to put a halt to construction deaths. 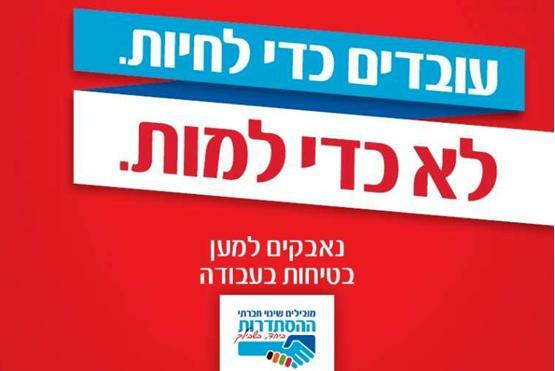 Two weeks ago, Nissenkorn declared that if the government and Knesset do not take meaningful steps to stop the phenomenon, the Histadrut would launch a general strike. That day, two construction workers died on the job. The Histadrut enumerated several demands, including the adoption of European standards for construction and strengthening enforcement of security measures, including mandatory harnesses. The Histadrut also demanded that all government construction and infrastructure tenders include security requirements. A bill on this matter was submitted to the Ministerial Committee for Legislation on Sunday, but the committee put off discussing it until four months from now. The bill would require companies participating in construction tenders for the government, municipalities, government companies, and other government entities to meet safety standards. The goal would be making safety standards uniform.